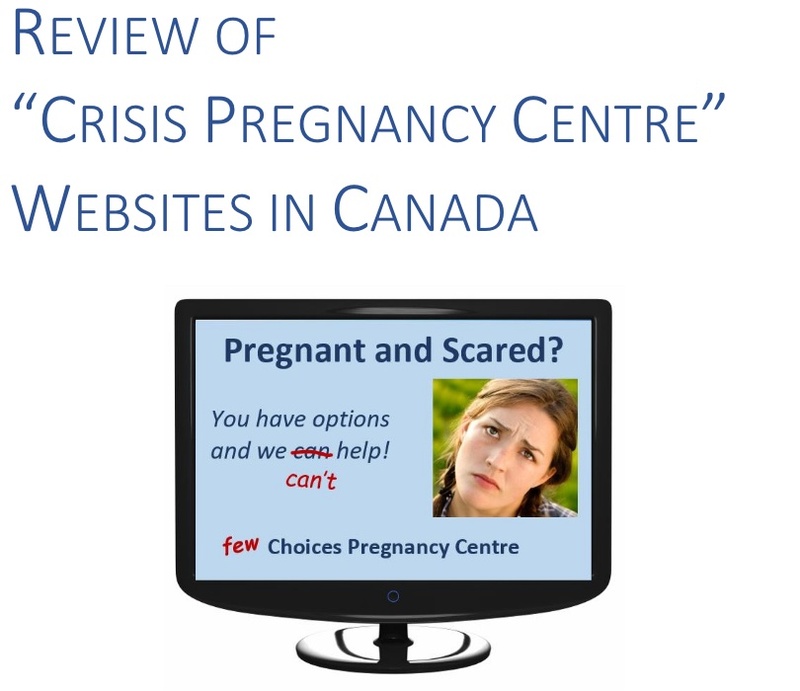 The Abortion Rights Coalition has released a major study into the online presence of Canadian fake clincs, or crisis pregnancy centres (full PDF report). Anti-abortion counselling agencies in Canada often present misinformation on their websites or fail to disclose their anti-choice or religious agenda to prospective clients, according to a new study published today by the Abortion Rights Coalition of Canada. Crisis Pregnancy Centres (CPCs) are anti-choice agencies that present themselves as unbiased medical clinics or counselling centres, and which often claim to provide women with non-judgemental information on all their options when faced with an unintended pregnancy. However, CPCs are not medical facilities, most are Christian ministries, they generally will not refer clients for abortion or contraception, and many promote misinformation about abortion. CPCs in Canada have no regulatory oversight; however, 68% of them are registered charities. 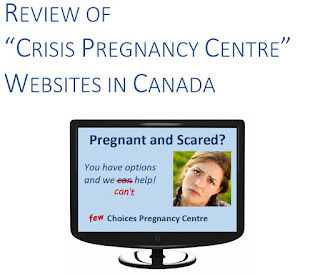 Researchers identified 180 CPCs in Canada, and looked at the 166 of them that have websites. Results were not surprising. Well, not to those of us who have made it our mission to get these fake clinics regulated, defunded, and stripped of charitable status. They lie about abortion risks; they promote sexual abstinence and adoption as ideal solutions to unwanted pregnancy; they fail to disclose their religious agendas; they do not reveal that they refuse to refer for abortion or contraception. In fact, the Canadian study mirrors much of what was reported last year in a USian report, titled "Crisis Pregnancy Centers Lie." (PDF). The situation in the US is much more dire. There are many, many more of these fraudulent operations and an astounding number of them get significant government funding. The Canadian study reports on CPC funding (pp 29–30 of PDF). It seems that not much public funding goes to these places, but what does must be stopped. A majority of them have charitable status. Many CPCs also enjoy charitable tax status, which significantly increases their ability to fundraise (Arthur 2005). Out of the 180 CPCs we identified, 68% (122) had charitable tax status. However, Canadian groups should not be eligible for charity status if they disseminate biased or inaccurate information that is disguised as “education” or “counselling.” (Arthur 2005; Canada Revenue Agency 2013). Coincidentally, Amanda Marcotte wrote recently about an analysis of USian CPCs' own data. Nicole Knight Shine looked at the numbers and concluded they fail miserably at their mission -- if their mission is to dissuade women from choosing abortion. The thing is that CPC centers know this. Shine’s numbers come directly from their own database, showing that they they are well aware that the vast majority of women who come in their doors will not be intimidated, much less persuaded, out of their abortions. So why do they keep plugging away at it, when they know full well they are terrible at what they claim they want to do? It is this atmosphere in the US that makes the endless screwing around with abortion laws and restrictions possible and, seemingly, acceptable. In Canada, we are -- so far -- successfully resisting any similar attempts to recriminalize abortion. This new study demonstrates though that we must remain vigilant and aware of what anti-choice forces are up to. We must impede them any way we can. Regulate them, defund them, and strip them of charitable status. And for anyone interested in reading or writing about abortion, the ARCC report is full of helpful links and resources. On a personal note -- and in what might be a first for a "serious" study -- DAMMIT JANET!, a mere blog, is cited for our efforts in getting public funding yanked from a fake clinic in Ontario. ADDED: This is the only media story on the report I've found: Global. Thank you Fern, very nice piece, and I like that you tied it to the recent U.S. pieces by Marcotte and Shine. I love Marcotte, she pulls no punches. I had forgotten that stat about 32.7% of clinics near a CPC experienced severe violence, compared to only 11.3% of clinics not near a CPC. Geez! How many CPCs are near/next to clinics in Canada? I know of at least 2 - Aid to Women in Toronto and Women's Care Centre in Fredericton, but there must be more. Btw, you are also mentioned in the Acknowledgments (that's for the "providing advice/support" part). Thank you! Finding out how many CPC "co-locate" (love the word) in Canada would be good. This is an excellent project. Glad to be aboard. They are probably in it mostly for the money. Donations they pocket. A nice tax audit could be interesting, to find out what % of their donations are spent on salaries. Some people spread hate for a living. It is their chosen profession. I know of a case in another kind of file (racism). You can nose around at Canada Revenue Agency. Here is what I found out for the fake clinic in Hinton, AB, in two posts. CRA doesn't demand they list all their salaries, just ones over $40K a year. Hinton has one over that and it accounts for just under half of its expenses. So, yeah, it's a living for some.